The book opens with a basic overview of Steampunk then launches into a fictional character piece that becomes the narrative throughout the book. The book breaks into “a travelogue of 11 chapters,” each exploring a different set of creations – from locomotives to space ships to the more esoteric. Most of the creations are given a page or two and are given writings as if they were in a travelogue or a museum, but written in the parlance of the pseudo 19th century characters. The big pictures give a good feel as to what comprises each sculpture and how it fits within the Steampunk world. Some of the pictures are black and white, sepia toned, or just stylized, and I felt it obscured some of the details of the creations, taking away from the builder’s work, but I would hope they are within the builder’s vision for the presentation when Himber included their LEGO work within the book. The work of over 50 LEGO artists are featured in the book, giving the book some real variety in the projects. Walkers and other flights of fancy to reinterpretations of real world objects like trains and cars to reimaginings of fictional science fiction spaceship are explored through the use of LEGO bricks by the different builders, each having its own interpretation of what Steampunk is and how these different builds would exist within the Steampunk world. 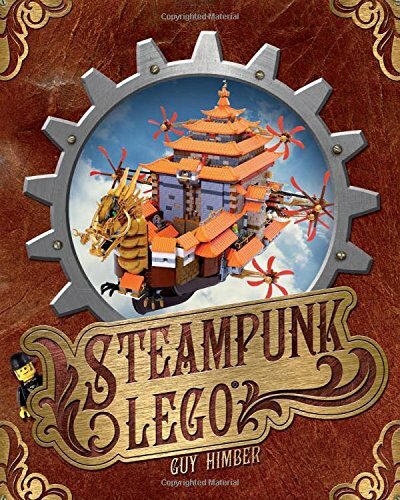 For the Steampunk and LEGO aficionado, Steampunk LEGO is an interesting exploration into what can be done at the crossroads of both. While not teaching what Steampunk is nor how to build Steampunk creations with LEGO, it is always inspiring to see what people build when the inspiration strikes them.